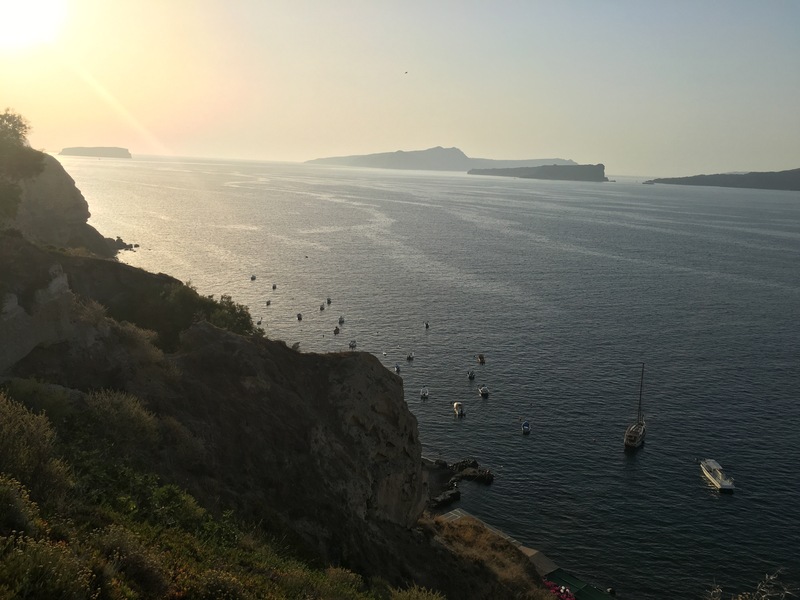 This past week I have traveled to Santorini, Greece – on my own! Originally I had planned to come with a friend but plans fell through and in the spirit of adventure [and cost] I decided to continue with my journey on my own. Now, I know it’s cliche to say that being on your own is life changing, eye-opening even – but it’s so true! If someone had asked me six months ago whether I would ever travel ABROAD on my own, I likely would have said no due to the possibility of danger. But see, that’s the thing: we never know what will happen next, who we will encounter, what experiences lie ahead. Being on my own helped me realize that the future is constantly changing, we are constantly changing, and why not make the most of our future by experiencing whatever life throws our way [sometimes on our own] to expand ourselves and become, well, ourselves. I decided to hike down a cliff after dinner and was pleased to find a small black sand beach – and had it all to myself! Over the course of the last five days I have been able to lug my suitcase up and down a cobbled road to find my very first [ever] AirBnB stay, which happened to be much better than I had ever expected! After dropping off my luggage at the reception desk, I went back towards the bus stop I had originally started at and sat at a small family owned cafe to relax and read a book, as well as catch up on social media since I had been without internet for about 12 hours (had to let family know I made it to Greece alive). It was peaceful to just sit and watch as life moved around me, seeing vespas and large couch buses share the same lanes, and watch locals feed in and out of Zoto’s Cafe for a pastry and Frape. Over this journey I learned how to enjoy a meal on my own, as well as enjoy my own company. 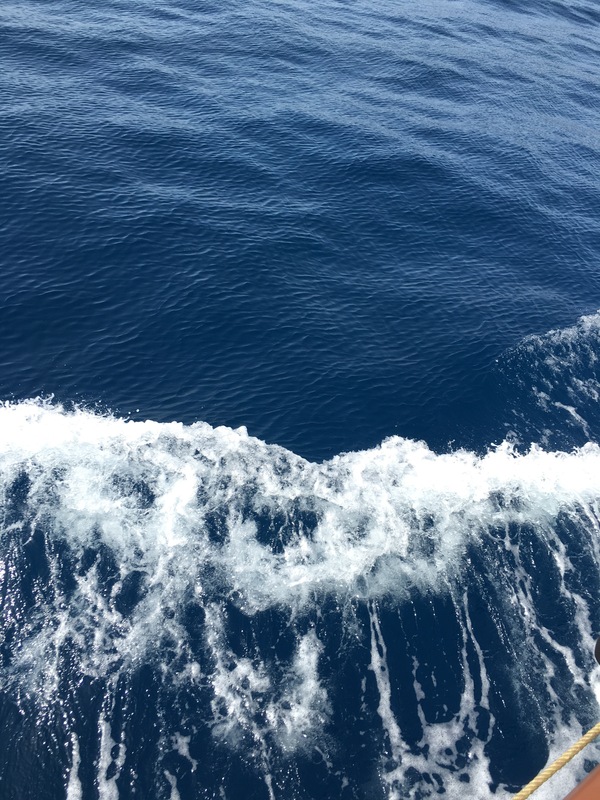 Being able to do as I pleased such as hiking down a cliff to a remote beach, or just lounging by the pool for a lazy day seemed even more refreshing because I did not have to worry about pleasing someone else’s travel plans. I was able to spend time in Karterados at Villa Pelekanos for two nights and moved further South on the island to Akrotiri and stayed at Hotel Rodakas for another two nights. My first day in Santorini accidentally became my sleep day, as I fell asleep around 2pm that afternoon after checking into the hotel and woke up around 6am the next morning. Thankfully, I had managed to schedule an excursion for the next day prior to sleeping and woke up in time to start my adventure! For only 30 euros I booked an all day excursion which allowed for a pirate ship ride to hike a volcano, swim in hot springs within the Caldera, spend a few hours in Thirasia for lunch and swimming, and end the night in Oia to watch the gorgeous sunset over the blue domed church roofs. The next few days became more relaxing days as I wanted to unwind before coming home and jumping right back into work and no play. From roaming through the villages, jumping on the local bus to see where it would take me, returning to Zoto’s cafe for a croissant, enjoying sunset on my own on the beach, and now simply enjoying my final day abroad by renting a motorcycle to explore the villages further and trek down to the different beaches! It is with a happy heart that I am pleased to say my Summer Abroad has come to an end, but the travel bug has bitten quite deep and will be returning to Greece in December! The memories I have been fortunate enough to make over the past 45 days will live with me forever, and the friendships I made are a few of the strongest I have ever had. I have a family of friends who travelled the world with me and stuck by my side through all of the silly, crazy, scary, and upright hilarious encounters throughout our travels. This post is dedicated to those lasting memories, the friendships, and new stories to tell for the future. I wish you all the best, enjoy the rest of your week and tune in this Sunday for another post. As always, we would appreciate feedback and suggestions on what you would like to read about next. If you’re feeling adventurous, share your own stories with us about your travels and we would love to share those as well. ← Cheers to you, Dad’s! Oh my goodness, I have always wanted to travel alone somewhere beautiful like this! You are braver than I am. So glad that you enjoyed your trip, the photos are lovely! Oh my I’ll add that to my reading list! Thank you! Gorgeous Photos!! Definitely a place I want to travel to! Hello Crystal! The timing of this blog post couldn’t be more perfect because I am leaving for Santorini in exactly 24 days!! I am beyond excited, I’ve been dreaming of this trip for years. We are also going to another Greek island called Paros know for its beaches. We will also be staying at Airbnbs which I am slightly nervous about but will hopefully work out great.